Microsoft just wrapped up its E3 2018 conference, making a bunch of big announcements and showing off a ton of games that’ll be making their way to Xboxes and PCs in the coming months. We got the standard Microsoft trifecta: a new Halo, a new Forza (Forza Horizon 4, which is set in Britain), and a new Gears Of War game (or three new Gears games, to be exact). But there was a lot more news in this show beyond the usual. For starters, the sadistic geniuses at FromSoftware, the studio behind Dark Souls and Bloodborne, took the wraps off the mystery game they announced last year. Turns out it’s a bloody, fantastical ninja game called Sekiro: Shadows Die Twice, and—surprise, surprise—it looks like it’s channeling a lot of the mystery, grime, and demanding swordplay of the Souls games. It’s being published in America by Activision and is set to launch in 2019 on the Xbox One, PlayStation 4, and PC. Later, Capcom confirmed the long-rumored return of Devil May Cry with Devil May Cry 5, which gets back to the series’ roots after Ninja Theory’s divisive 2013 reboot. 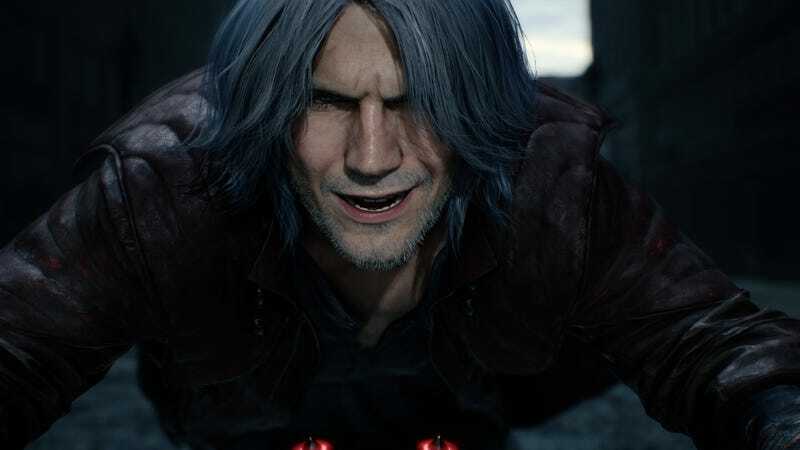 It looks to be a direct follow-up to DMC4, with the young ivory-haired punk Nero dominating the trailer and stubbly old Dante only appearing in the final moments. It’s scheduled to launch in spring 2019. Also announced at the show was Dying Light 2, a sequel to the 2015 parkour-and-zombies game. The sequel was introduced by famed games writer and designer Chris Avellone, who’ll be working on the narrative side of the project. Its vision of a zombie-infested post apocalypse is being called the “modern dark ages” and is being touted as “a brutal, bleak, and unforgiving reality”; so in other words, it’s really only the zombies that are separating it from actual reality. Ubisoft also went hard on bleakness with our first look at The Division 2, its follow-up to its ambitious but flawed online shooter. This one’s set in a—you guessed it—post-apocalyptic Washington D.C. and is set to launch on March 15, 2019. And in case you wanted more post-apocalypses, Bethesda mastermind and meme-magnet Todd Howard took the stage to give a better look at the recently announced Fallout 76, which he described as the largest game yet for the series—four times larger than Fallout 4, specifically. And in case you wanted the opposite of bleakness (except for the part where it’s hard as hell), Microsoft announced we’ll be getting another dose of frantic cartoon action with Cuphead: The Delicious Last Course, a new set of downloadable content that’ll bring new bosses, weapons, and even a new character to the throwback hit sometime in 2019. Other major reveals included: Just Cause 4, another entry in Avalanche Studios’ wild open-world action series; our first look at Cyberpunk 2077, CD Projekt Red’s sci-fi follow up to The Witcher III; Session, a new skateboarding game that isn’t Skate 4; The Awesome Adventures Of Captain Spirit, a spin-off from Life Is Strange that’s definitely going to make you cry; a new god damned Battletoads game, because this is what happens when you don’t stop joking about that sort of thing; and Jump Force, a 3D fighting game that’ll be bringing together all your favorite anime characters from Dragon Ball, One Piece, Naruto, and Death Note. We also got a handful of new trailers for previously announced games. Our latest glimpse of Kingdom Hearts III, which will be bringing the series to Xbox for the first time when it launches in January 2019, included a peak at a world based on Disney’s Frozen. Terry Crews gave us a lengthy look at the long-gestating Crackdown 3, which has been delayed yet again and is now scheduled to release in February 2019. Ori And The Will Of The Wisps is still looking like a gorgeous sequel to the gorgeous platformer Ori And The Blind Forest. The Russian post-apocalyptic vision of Metro Exodus is got an intense new trailer and a release date of February 22. Lara Croft wreaked havoc on Mexico in new footage from Shadow Of The Tomb Raider. And last but not least, providing some much needed relief from all the misery and violence, there was Tunic, an adorablke Zelda-like game starring a fox. That’s a lot of games. But it’s also a lot of games that’ll be coming out on platforms other than the Xbox. The lack of quality exclusive releases on its console has been a huge issue for Microsoft in recent years, something the company acknowledged in this show as it took a break from all the game announcements to mention it had acquired a handful of independent studios. They include: Playground Games, whose been doing stellar work with the Forza Horizon and is rumored to be developing the next entry in Microsoft’s Fable series of fart-filled RPGs; Ninja Theory, developers of DMC: Devil May Cry and last year’s excellent Hellblade; Undead Labs, creators of State Of Decay; and Compulsion Games, the team behind The Prisoner-flavored survival game We Happy Few. Microsoft also opened a new studio called The Initiative, which will be led by Darrell Gallagher, who formerly headed up Tomb Raider developer Crystal Dynamics. There was no news about what any of those teams are working on, but hopefully, they won’t go through the same troubles as Rare. Or Lionhead. Or Twisted Pixel.